Sketch Engine offers using thesaurus from hundreds of text corpora in dozens of languages. Why use the distributional thesaurus? The quality of the automatically generated thesaurus is heavily dependent on the size of the corpus. Small corpora will produce lower quality results. How to generate a thesaurus? Log in to Sketch Engine (or click Home in the left menu) and select a corpus. The header shows the lemma, corpus name and the frequency of the lemma in the corpus. Clicking the frequency will bring up the concordance. The list of synonyms is a list if lemmas ordered by Score (=similarity). 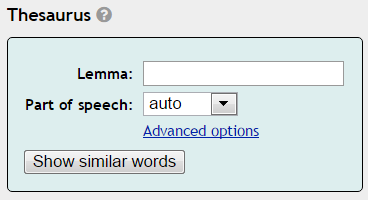 The lemmas are clickable and will bring up a Word Sketch Difference. Score is a measure of similarity, Freq is the frequency of the lemma. The word cloud is clickable. Click any word to bring up a Word Sketch Difference. A distributional thesaurus is an automatically produced thesaurus which finds words that tend to occur in similar contexts as the target word. It is not a manually constructed thesaurus of synonyms. The statistics used in Sketch Engine to calculate the Thesaurus is described in this document. An efficient algorithm for building a distributional thesaurus (and other Sketch Engine developments). In Proceedings of the 45th Annual Meeting of the ACL on Interactive Poster and Demonstration Sessions. Czech Republic, June 2007, pp. 41–44.